The Fellowship was fortunate enough to obtain a copy of RENATO JONES: THE ONE% #1 from Image Comics. Kaare Kyle Andrews writes, draws and colors, and Jeff Powell letters. Renato Jones disappeared during the home invasion that killed his parents. He was three. He was found eight years later on the streets, and was welcomed back to his palatial estate. Those years on the streets taught him much, and the rest he learned from a family servant. And now he’s going to make all of the cruel rich people pay. I have to admit I have not seen this take on a Robin Hood story before. Vigilante justice on the 1% for crimes against humanity is a cool twist. And this first issue does a wonderful job of building layers into Renato’s character, including some possible questions about his lineage. The muted colors really add to the grit of the fight scenes, as well. And the ads are a nice touch. I’m excited about this one. There are some great story elements at play here, along with an original take on a classic trope. We should see some good things in this title. 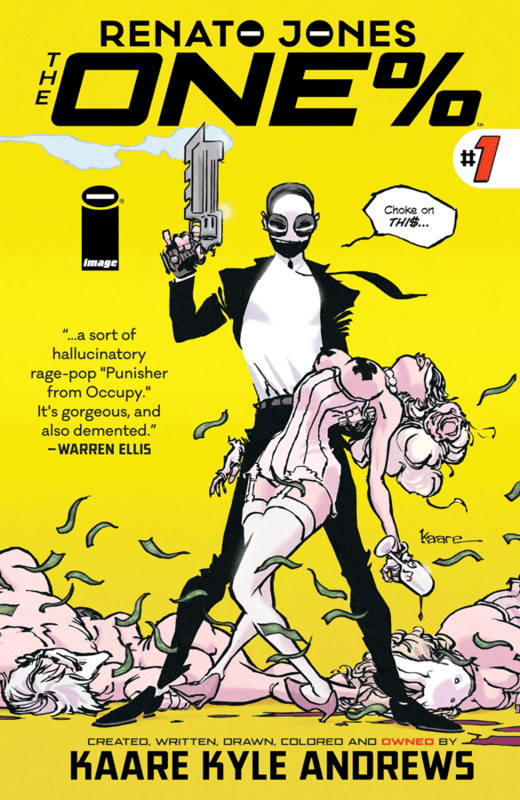 RENATO JONES: THE ONE% #1 is available now at your FLCS or at imagecomics.com.